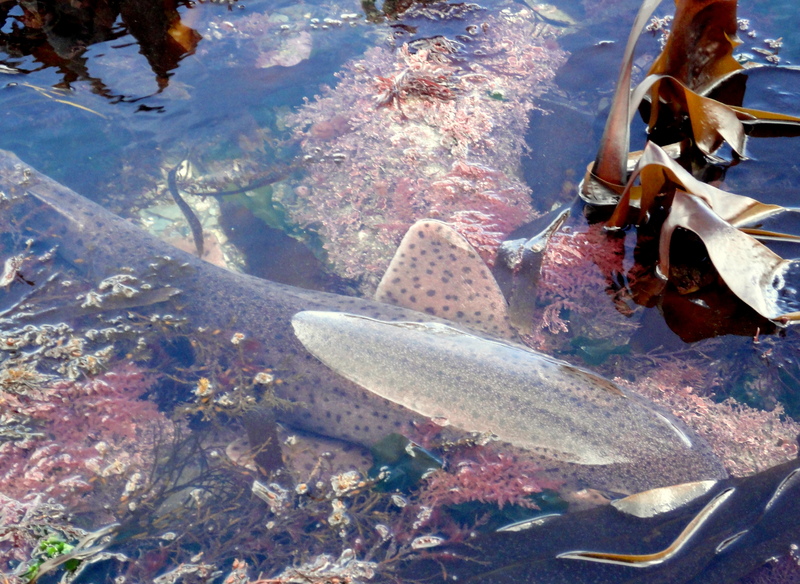 Fish often become trapped in the shallows during exceptionally low tides, even big fish like mullet and wrasse, but it’s the first time I’ve met an adult shark on a rockpooling trip. It’s been a cold but productive afternoon and I’m about to head home to defrost my painfully frozen fingers when a movement in the kelp around ten metres away grabs my attention. At first I assume it’s a shoal of fish searching for a way back to the open sea, then a powerful tail flicks up and, even from this distance, I can see it’s large. I think I know what it is even before the two dorsal fins break the surface. This is an adult shark, a bull huss or nursehound (Scyliorhinus stellaris), the larger of the two species of catshark that occur inshore here. It can grow to around 1.5 metres and this specimen isn’t far off that length. My numb fingers struggle with the buttons on the camera. I can’t believe that I’m in water barely shin deep watching a shark. It may have come in to lay its long jade-green egg case. . I’ve found several live ‘mermaid’s purses’ today, some freshly laid, attached to the seaweed with curly tendrils. I’ve never seen the adult shark here before though. Shark egg case (Scyliorhinus stellaris). The live fish hatches after around 7-9 months. If you find a live eggcase attached to seaweed, always leave it where it is. If you find it detached but alive, keep it in sea water and take it to your local aquarium. I watch the shark weaving among the weed, trying to find a path to the deeper water. It seems about to swim away, then turns. I hold my breath as it thrashes through the shallows, its head jerking from side to side, heading straight for me. As the shark thrusts towards me at ankle height, I’m beginning to wonder whether it’s about to put holes in my waders. I know these animals aren’t aggressive, but this one is trapped and I’m guessing it probably hasn’t read the tide times to know that the water’s about to rise. Rightly or wrongly, my fear of getting cold water in my boots far outweighs my fear of a shark bite. When it’s less than a metre away from my toes it stops, behind a low rock. A nursehound or bull huss by my foot in the shallows. I take photos, being careful not to get too close. I’m sure it’s aware of my presence; it seems to follow me with its elongate, almost feline eyes. The bull huss rests calmly, the water deep enough to allow it to breathe comfortably. I’m amazed by the length of it, by the beautiful spotted patterning on its rough skin, by the powerful spread of its pectoral fins. Shark (bull huss) – from the catshark family. So called due to the shape of their eyes.. Rain spatters in on the blustery wind. I step reluctantly away and head up the deserted shore, my breath still short with the shock and excitement of the encounter, desperate to tell someone but with no words to describe just how special that moment was. Bull huss are harmless to humans and it’s very unusual to find one on the shore like this. Still, children often ask me if they might find sharks in rockpools and I’m delighted that now I can say that yes, you might – I did, so you could too! 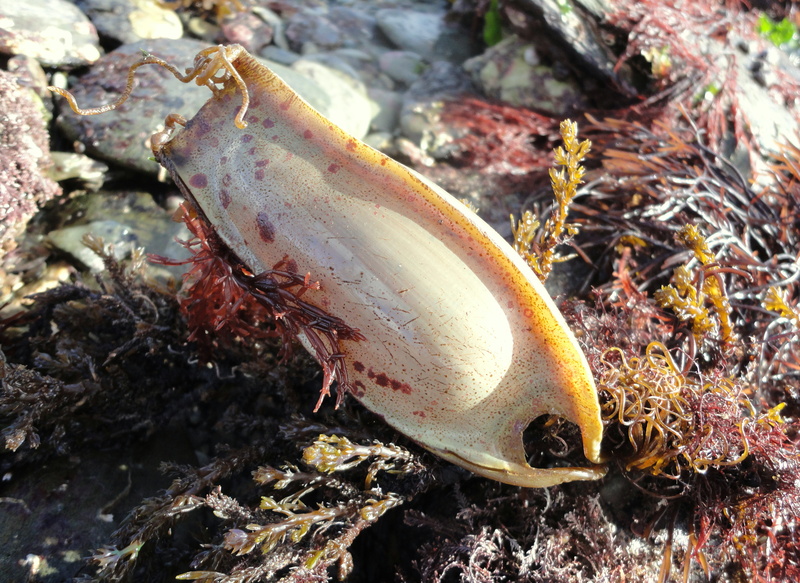 You can find lots of information about shark conservation on the Shark Trust website including this fantastic guide to egg-case identification and recording. Sharks and rays are slow breeders and many species are endangered. Fascinating account Heather, I can catch your excitement in the blog, thank you. Thanks, Frances. I won’t forget yesterday’s shark encounter in a hurry. It was wonderful. Wow, what a find. Do you know if it made it back to the ocean safely in the end? 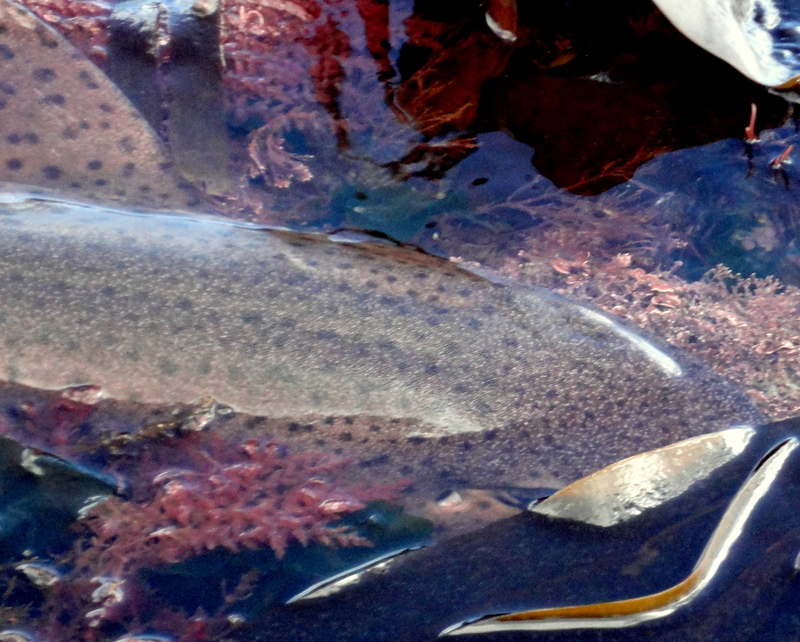 A full grown Shark in a rockpool in UK waters, who’d have believed that was possible. Thanks, Tony. Fear not. The shark was comfortable in a large area of shallow water exposed by the tide. Raised rocks and gravel beds at the edges were making it difficult for it to get out at the point I took the photos although it could have reached the sea if it went in the right direction. The tide was already on the turn and within an hour there would be a metre or two of water with access straight out to sea. The shark wasn’t in any danger at all. This area is normally well underwater even at low tide. 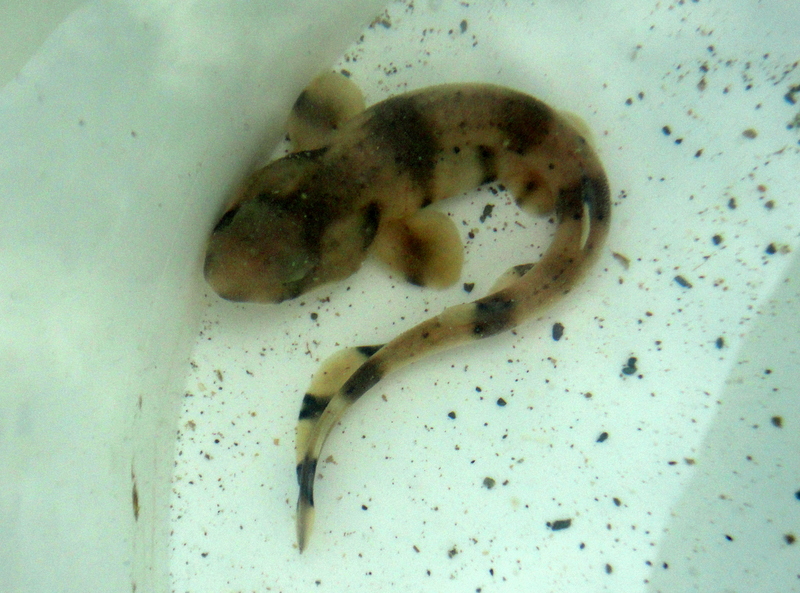 Are you sure this isn’t a lesser spotted dogfish (scyliorhinus canicula) also now known as a small spotted cat shark? Looks like one to me and is much more likely to be seen in a rockpool than a bull huss!